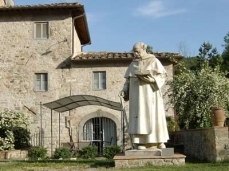 You can taste the atmosphere of the past in the ancient Abbott`s Mill, a mill former belonging to the Passignano`s Abbey, built in 1170 along the river Pesa, near the village of Sambuca. 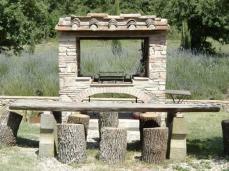 The Abbott`s Mill is the most important and ancient mill in the Chianti area, and it still maintains its original look. There are many traces of middle-aged structures: walls and arches built using the ancient technique called "a bozze di filaretto scalpellato di alberale", and the "colta" where the Pesa river`s water was chanalized in case of scarcity of rainfalls, in order to make the two mills working (one mill was for the flour and the other for the fodder). A beautiful Late-Renaissance portal, a XVI century terracotta niche, and the millstones` room itself (today preserved as a small museum), can still be admired. The mill, surrounded by the Chianti countryside, lies next to the Pesa river. One km away you can find a small village, that can be reached on foot, by car or by bicycle. Florence is about 20 km away, while Siena is 35 km far. 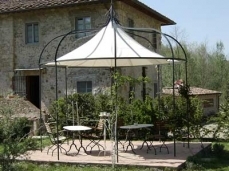 The "Abbott`s Mill" has a perfect location for daily visits to the most historical and artistic places and towns of Tuscany. You can even take a bath in the Pesa river that runs along the Mulino dell`s Abate, enjoying the uncontaminated nature of this area. Swimming-pool: Our swimming pool (7,5 metres x 14,5 metres - 1,50 metres deep) is next to the house, and it is covered with handmade cotto bricks and pietra serena slabs. The swimming-pool is completely immersed in the green and it looks to the Pesa river. Barbecue: The barbecue and the surrounding area, equipped with tables for outdoor meals, is at the disposal of our guests. The apartments were restored preserving the original materials and structures: floors covered with cotto and ceilings with wood girder and "mezzane" at sight. The antique furniture was chosen to let our guests tasting the atmosphere of the past and of the rural life in the Italian countryside. Each apartment is independent, with kitchen or living kitchen, a bedroom and a bathroom. Each apartment has got private outside space, garden or veranda with tables and chairs for spending hours in total relax. Ample Parking space is available inside the property and automatic gate-opening remote-control are at your disposal. Apartment Guiditta: The Apartment consists of a double bedroom, bathroom with shower, private terrace. The letters are not case-sensitive. Do not type spaces between the numbers and letters.